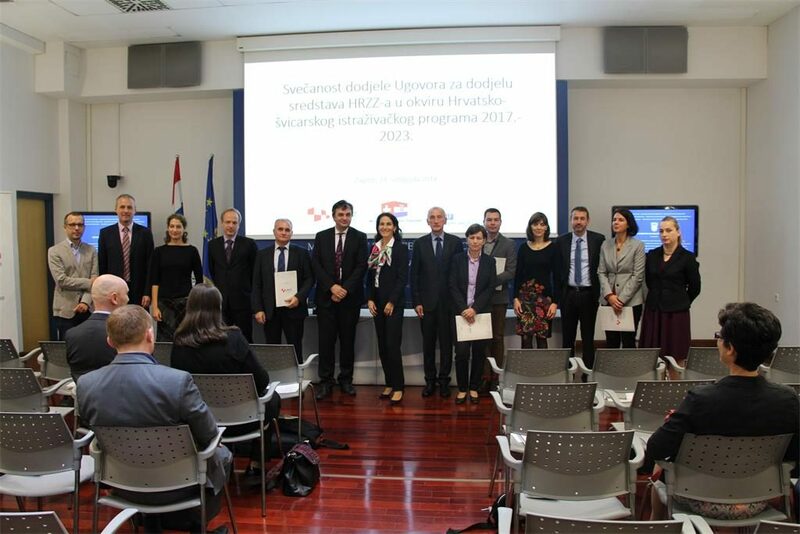 On October 24, 2018 at the Ministry of Science and Education was held the ceremony of signing Grant Agreements with Croatian Science Foundation for 11 projects which were accepted for funding under the “Croatian-Swiss Research Programme 2017-2023” (CSRP). CSRP is one of the projects within a framework of Swiss-Croatian Cooperation Programme to reduce economic and social disparities within enlarged European Union and this project is implemented by Croatian Science Foundation and Swiss National Science Foundation. Through the implementation of CSRP project will be ensured preconditions for successful implementation of scientific-research projects through which will be achieved close cooperation between Croatian and Swiss researchers as well as transfer of knowledge, skills and technology. The value of “Croatian-Swiss Research Programme 2017-2023” is CHF 4.67 million, with Swiss contribution in the amount of CHF 4 million and Croatian co-financing in the amount of CHF 0.67 million. The ceremony was opened by the Ambassador of the Swiss Confederation in the Republic of Croatia, Ms. Emilija Georgieva, who emphasized the commitment of the Swiss Confederation to the advancement of the science system in the Republic of Croatia. Afterwards the attendees were addressed by the State Secretary at the Ministry of Science and Education, Mr. Tome Antičić, who explained the role of the Ministry of Science and Education in implementation of the “Croatian-Swiss Research Programme 2017-2023” and its importance for promoting excellence in Croatian science system. The president of the Croatian Science Foundation Board, Academician Mr. Dario Vretenar, briefly presented the “Croatian-Swiss Research Programme 2017-2023” and emphasized the importance of the international cooperation of Croatian Science Foundation and Croatian scientists with their Swiss partners. Furthermore, Mr. Vretenar thanked to all participants in the project selection process and congratulated the selected researchers and their organizations. Prof. Mirjana Čižmešija from the Faculty of Economics in Zagreb, the co-chair of the Evaluation Panel, presented the procedure of evaluating received project proposals, based on which 11 projects were selected for financing out of received 111 project proposals. The ceremony was attended by project leaders and leaders of their organizations, as well as Croatian members of the Evaluation Panel, representatives of the Embassy of the Swiss Confederation in the Republic of Croatia, the Ministry of Regional Development and EU Funds, the Ministry of Science and Education and Croatian Science Foundation.